From either north or south, take the A1 until you reach its junction with the B661. This is the next roundabout of the A14, or north of the St Neot’s golf club junction with the B645. From the north-east or north-west, travel along the A14 until its junction with the A1, then proceed south. From Cambridge, either the A14 and then south on the A1, or the A428 and then north on the A1 are possible routes. From Bedford the A421 to its new junction on the A1 and then north is the obvious route, but if you would like a country drive that also takes in Kimbolton (with a short detour) take the B660 from Bedford and join either the B645 or the A14, turning east, and proceed as above. Parking is easy on the high street. Parking within the site is private. There is a railway station at St Neots, about 5 miles south of Buckden. This station is on the main London to Peterborough line with services around half-hourly. Peterborough itself is a hub with services from all directions converging there. Bus services (no. 66) run between Cambridge - St Neots – Buckden - Huntingdon, stopping at taking about 20 minutes travelling from St Neots to Buckden. Sunday services are not running as of time of writing (May 2016). The no. 65 runs from St Neots to Buckden, Monday to Friday only. The nearest Long Distance Path is the Greensands Ridge Walk (Leighton Buzzard to Gamlingay) which crosses the A1 at Sandy – from Sandy, you can hop on the Peterborough train and go one stop to St Neots as above. Buckden was once a ribbon development along the Great North Road, but the modern A1 has been diverted leaving an easily accessible high street, with a number of attractive pubs and eateries. 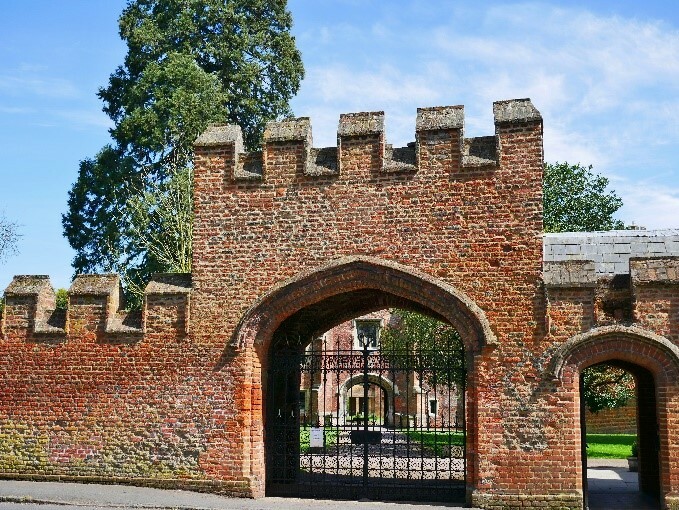 Buckden Towers, as it is now known, is situated in the pretty south-Cambridgeshire village of Buckden. A mediaeval house, extensively renovated in the late fifteenth century, it housed Queen Katharine of Aragon after she had been banished from Henry VIII’s court. Buckden Towers is owned by the Claretians, a Roman Catholic order and is the centre of the Roman Catholic parish of St Hugh of Lincoln. 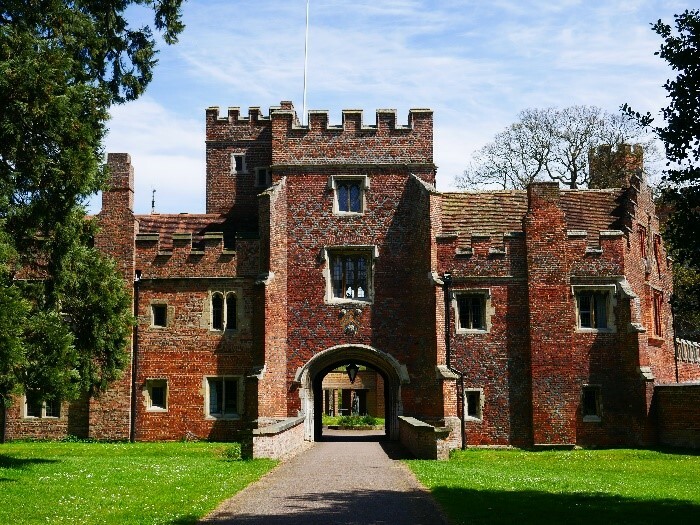 The property at Buckden is a centre for retreats, but visitors are permitted to walk in the grounds, and view the remaining mediaeval buildings from the outside. Approaching the complex, you are immediately struck by the beautiful red brick wall which runs along the road front – bear in mind that this road was once the main London – York – Edinburgh route, so although the village now has rather a forgotten feel, in Katharine’s day, there would have been plenty of activity. Entrance is from the west side, through the original outer gate. Straight in front, you can see the ditch that was once a moat, spanned by a bridge leading straight under the redbrick Inner Gatehouse tower. The tower is in the middle of the west range. Within the west range, the left hand side (facing east) has been partially rebuilt, but the right hand side range dates from the late fifteenth century. Through the gatehouse and into the main courtyard, the complex is built in a square. The wall running east-west from the bottom end of the aforementioned south range has a little viewing platform. From this, one can see the Queen Katharine Privy Garden from above and the delightful Parish Church of St Mary’s. At the end of this wall, in the south-east corner is the three-storey Great Tower block which provided the domestic quarters, and is probably the tower in which Katharine had her chambers. Famously, she locked herself in there when the Dukes of Norfolk and Suffolk arrived to move her to an isolated and unhealthy spot, far from any towns or roads. The east range (directly opposite the gatehouse) is a triumph of 1970s Roman Catholic church brick-building style, which may, or may not, be to your taste. The north range no longer exists, but a large Victorian house is situated to the north-east corner. Back on the west range, looking west this time, you can see that the renovations on one side have been completed with a stone element generally in Tudor style, but probably dating to the eighteenth century. Back on the west side of the moat-ditch, a garden wall runs south-west towards the corner of the exterior wall and street. This protects the delightful knot garden, designed in Tudor style, commemorating Katharine of Aragon. The garden is open to the public on weekdays, although you have to ask for the key. It is laid out in box format, with culinary, medicinal and dye-making herbs which would have been in cultivation in Katharine’s life-time.